I have never once made Chicken and Dumplings. Growing up all my life in New York, this was never a common dish to see on a menu, nor was it something my family served. Years ago I tried it for the first time while we stopped overnight in Georgia on our way to Florida. An extremely long trip in the car with two young boys. So long of a trip in fact that by the time we reached Maryland I was contemplating ditching my family at a rest stop and heading to the nearest airport to fly myself home. But that’s a whole other story. 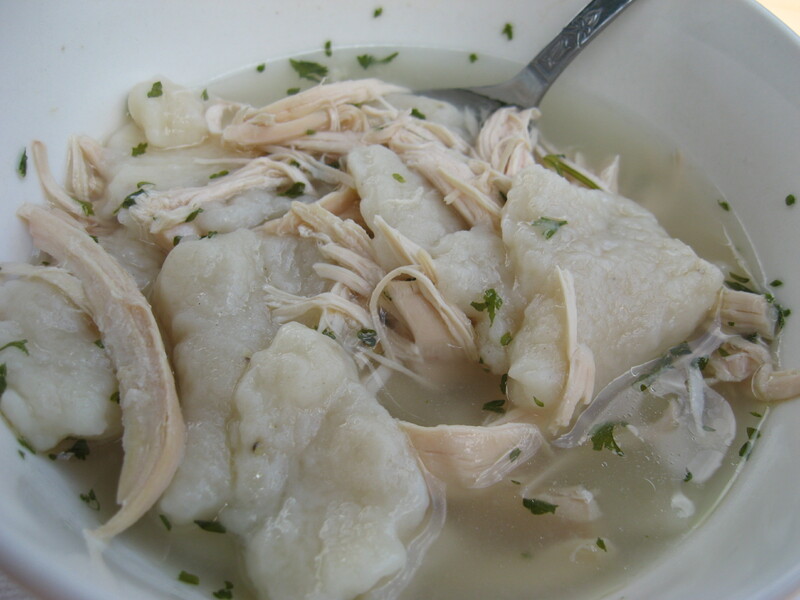 The reason behind this story was because it was the first time I had ever eaten Chicken and Dumplings and I fell in love at first bite. The restaurant we stopped at was nothing to write home about. It was pretty much a little dive down the street from the hotel we were staying at. There was a little round southern woman with the most adorable southern drawl who was not only the cook, but the woman who came to your table to welcome you to her kitchen and tell you what was on the menu that evening. And she was so right. She brought me out a huge bowl of this decadent comfort dish and after the first bite I fell in love with those little dumplings. I’ve had it several times since, and now that I know of it, I have actually found it on a few restaurant menus in our area. But nothing has ever compared to the bowl I had from that little dive of a restaurant we stopped at that night. Despite that it is July, and 98 degrees out with 210% humidity, I got into my head the other day that I wanted this dish. I had never made it, and I had found a couple of recipes, but all were different. I decided I needed to find out how to make this from a true “Southern Chick”, so I went to the source and asked some fellow bloggers on Twitter to send me what they had. I received two recipes from two different women from down South and decided to go with the first one I received. I’ve told you about Lana before and her blog Never Enough Thyme. She makes those awesome Overnight Sweet Rolls I’ve become so desperately addicted to! Well, here is her recipe for Chicken and Dumplings which I followed to perfection. I made this dish over a period of two days. 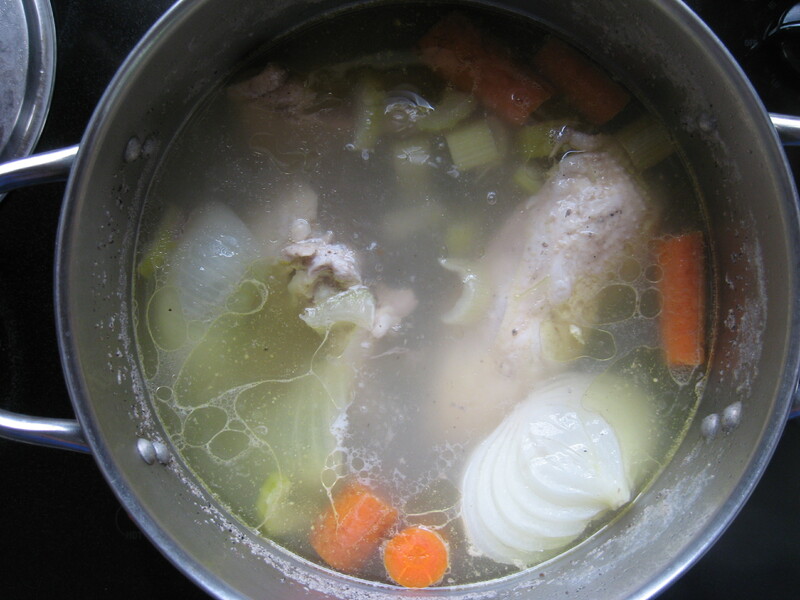 On day one I made the chicken broth and then did as her recipe instructed and refrigerated it overnight. The reason for that trick is because it’s easier to skim off the chicken fat after it’s gotten nice and cold, and you use that glorious fat in the making of the dumplings. Genius! The next day I made the dumplings, heated up the broth and the chicken on the stove, and dropped those little dough pillows into the softly boiling broth. What happens next is watching those little pillows puff right up. I knew before I served this dish there was no way my husband was going to be thrilled with it. He’s a weird one who doesn’t get into all the comfort dishes I love. Creamy, heavy bowls of macaroni and cheese and the like are just not his thing. But I really could care less, since I was craving this, I was cooking and it was what we were eating for dinner! Not really, but I did give them a look that conveyed the same message. The result was that my husband ate some leftover ribs from the night before, and my children ate what was on their plates along with stealing the rest of the dumplings out of the remaining broth that was sitting on the stove. The other recipe I received was this from Our Life In the Kitchen. This will be the second version I try, and from the looks of it, I may fall in love with that one as well! Thanks, Lana. Your little pillowey dumplings were the perfect antidote to my craving for this comforting dish. Once again one of your recipes did not disappoint! this looks so great! I would LOVE some asap. I would love to give you both some, but it’s gone. All that was left was some broth. It was a hit in our house, and hit my craving for some comfort! Hi Pam! I’m so glad you enjoyed the Chicken and Dumplings! We did, Lana! Thanks for recommending it! Yes! I’ve forgotten the basic singular possessive rule. Since I have only one family, outside of my extended family, you are correct. Thanks for pointing it out.